Retirement planning is mandatory today. Especially in countries like India where we don’t have any social security system in place. In India we see most of the people are worried about retirement and they want to continue their job/profession beyond 60 year age. Research reveals that 70% of individuals are unable to demonstrate financial readiness for retirement. Running out of money is serious worry which is bugging everyone. Simple question but yet very difficult to answer. One common answer is use retirement calculator to find out retirement corpus. God knows that predicted retirement corpus like this will be sufficient or not. Giving practical example, suppose you need only 50 Rs/- to reach to your office (transportation cost) do you leave house with exactly 50 Rs/- in your purse? You won’t. You carry at least 100 Rs or 200 Rs + ATM card + Credit card in your purse. Similar to this if you need X corpus for retirement you must plan for 2X or 3X. 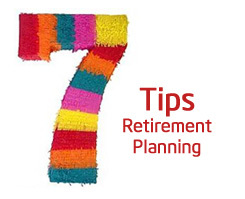 We are herewith 7 Tips of Retirement Planning which will surely help you to enhance your retirement corpus. Simple but very effective advice given by many is start investing early. If you save Rs.5000 every month for 30 years at rate of 12%, you will have good corpus compare to person who save same amount at same rate for 10 years. You should make habit of investing money before spending. Every month we have some regular expense like utility bill, household expense. Along with spending we should schedule our investment before spending. While making investment for retirement you must select Tax free investment instrument. PPF is one of the best retirement friendly & tax free investment instrument. Similar to PPF you have ELSS and various other option as tax free/tax saving investment. If you are investing money for retirement we recommend not put all money under one basket. This will increase the risk of losing all your investment or may limit return on investment. When you calculate retirement corpus please consider all future expense. People often omit expense like medical cost, cost of employing cook, maid etc. When deciding how much you need to save for retirement, make a list of all the expenses you may incur during your retirement years. You must relook in to your investment portfolio periodically. Based on return and market condition you must make changes. This will help you ensure that your retirement planning is on target. If you are not experience in field of financial planning and portfolio management we recommend engaging qualified financial planner. Hope these tips will be useful for planning your retirement.